In the autumn of 1917 Theo van Doesburg distributed the first edition of magazine entitled De Stijl from Leiden to 30 subscribers. A century on, art galleries and museums across the Netherlands are commemorating the beginnings of the one of the 20th century’s most influential art and design movements. Even if you aren’t familiar with the names of Piet Mondrian and Bart van der Leck there’s a good chance you’ll recognise work influenced by De Stijl, the art and design movement of which they were among the founding members. An exhibition of the two artists work will be displayed at Gemeente Museum in The Hague until 21 May 2017. Their compositions — featuring blocks of blue, red and yellow on white backgrounds — have inspired a range of work, including the logo of L’Oréal’s Studio range of toiletries and the patterns adorning dresses designed by Michael Barnaart van Bergen. With flakes of snow falling and the pools by the entrance to the Gemeente Museum frozen, King Willem-Alexander of the Netherlands declared the exhibition open on 11 February. 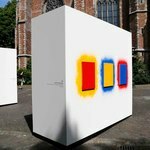 Piet Mondrian and Bart van der Leck: Inventing a new art is the first major exhibition of a year that will see events in museums and galleries across the country. It is part of Mondrian to Dutch Design. 100 Years of De Stijl, a celebration marking the centenary of the beginning of De Stijl. The movement has been described as “Holland’s most important contribution to twentieth century culture”. The final edition of De Stijl was published in 1931, the year of Van Doesburg’s death. At the time of the magazine’s inaugural edition the First World War was raging and Russia was experiencing the impact of the October Revolution. 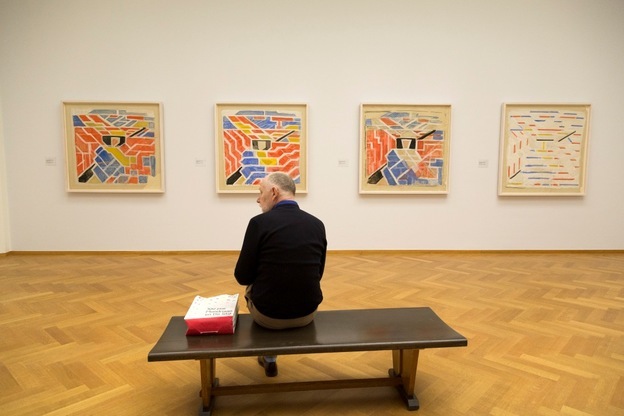 The founding members of De Stijl wanted to use art and design to shape a brighter future for the world. In the work of Gerrit Rietveld those ideas took three-dimensional form. Rietveld is remembered for his Red and Blue Chair and as being a driving force behind the creation of the affordable, flat-pack furniture that so many of us now take for granted. This exhibition opens with artworks from Van der Leck and Mondrian that predate their period of initial cooperation in 1916 at the village of Laren, roughly 25km south-east of Amsterdam. 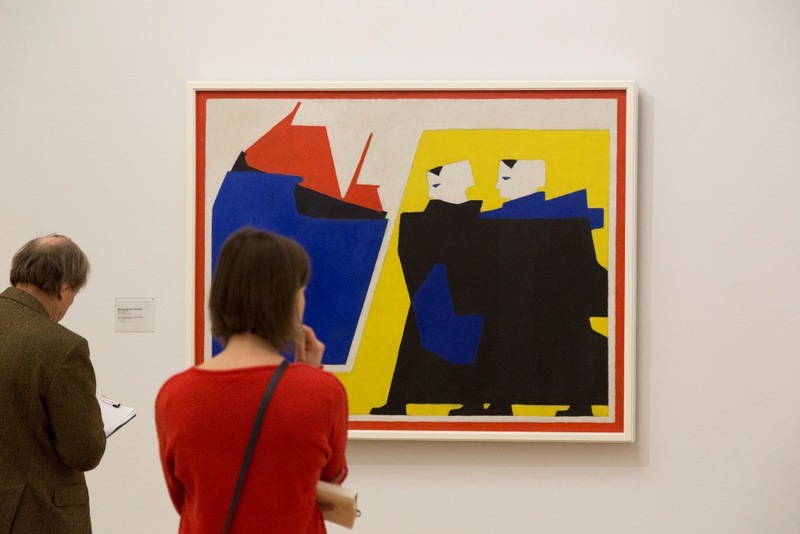 Van der Leck’s stylised depictions of people influenced Mondrian due to their use of bold colours. Mondrian’s abstract compositions, meanwhile, soon had an impact on Van der Leck’s depictions. 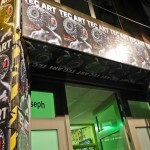 The works displayed in this exhibition illustrate how the two artists developed. Mondrian began linking shapes by lines while Van der Leck kept them open. 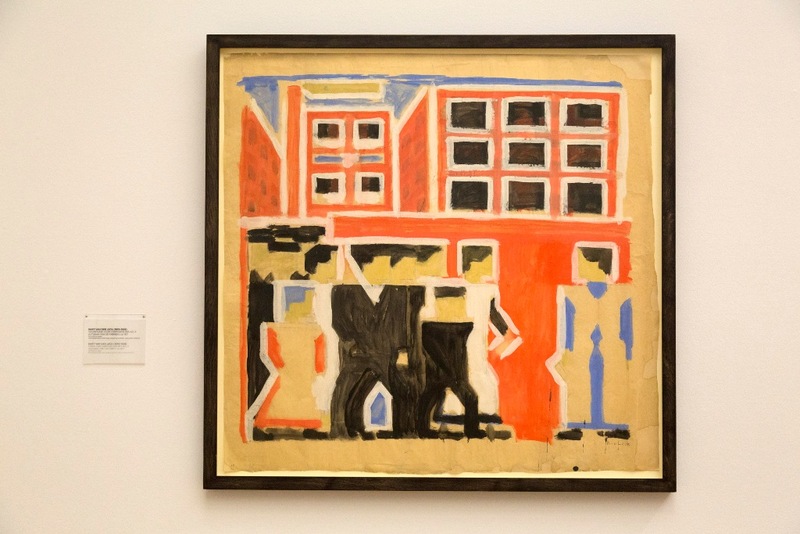 Van der Leck’s sketch of people departing an industrial building in 1917 is displayed next to the work that it inspired, Composition No. 3 (Leaving the Factory). Consequently, it’s possible to discern the abstractions and relate the blocks of colour to the scene it depicts. 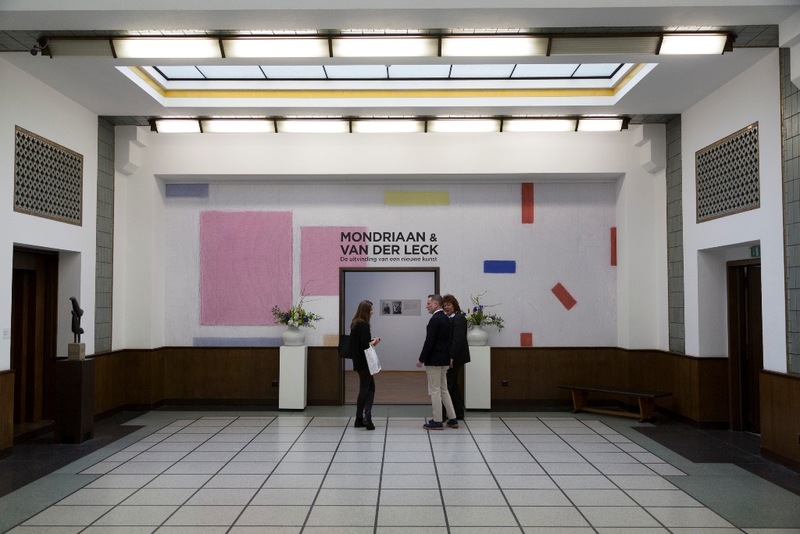 This expansive Mondrian and Ven der Leck exhibition at the Gemeente Museum will be followed by The Discovery of Mondrian — from 3 June to 24 September — and Architecture and Interiors. The desire for Style — between 10 June and 17 September. The museum holds the world’s largest collection of works by Piet Mondrian, including Victory Boogie Woogie, the unfinished work that is regarded as his masterpiece. The colourful lines on the diagonally displayed painting are said to depict the vibrant colours of New York City, where Mondrian died, having emigrated from wartime Europe, in 1944. Adult tickets to the exhibition cost €14.50. The Gemeente Museum is open between 10am and 5pm, from Tuesday to Sunday. 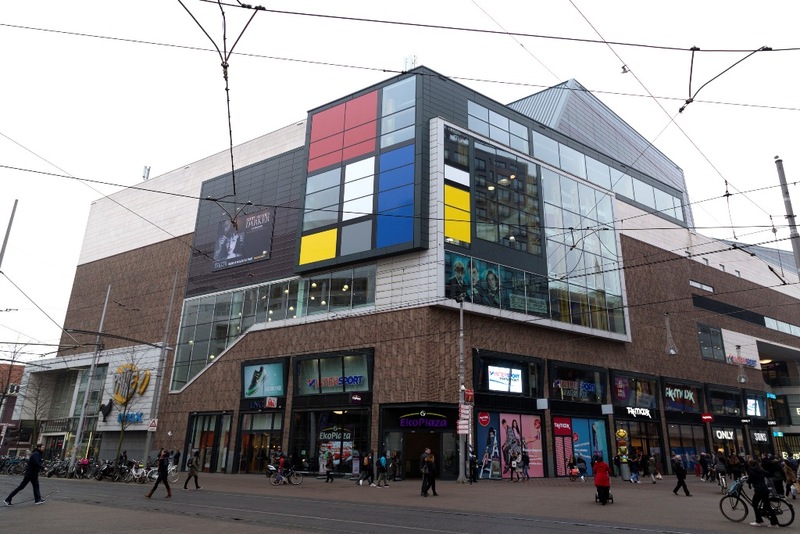 The Hague and Holland tourism information websites are both useful sources of information. The Hague is a 29 minute journey by intercity train, from the platforms beneath Amsterdam Airport Schiphol, which is served by KLM flights from across the United Kingdom. Flying into Rotterdam The Hague Airport is also an option from a handful of UK airports. The Hague Marriot Hotel (Johan de Wittlaan 30; tel. +31 (0)70 3525354) occupies a nine-storey building whose rear rooms overlook the back of The Hague’s Gemeente Museum. It is a five-minute walk from the hotel to the museum entrance. 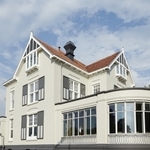 The Hotel Des Indes (Lange Vorhout 54-56; tel. +31 (0)70 361 2345) is a luxury hotel that has been in business since the 1880s. A copy of Isaac Israels’ 1916 portrait of Mata Hari is displayed next to the lounge. The hotel is just a few paces from Escher in Het Paleis, a former royal palace displaying works by the graphic artist Maurits Cornelius Escher. To coincide with celebrations marking a century since the beginning of De Stijl movement Waves at the Kurhaus (Gevers Deynootplein 30; tel. +31 (0)70 416 2636) is serving three (€62.50) and four course (€74.50) Taste of Mondrian menus with a souvenir Mondrian plate. The meals are served in the dining room of the grand hotel that overlooks the beach and pier at Scheveningen.